Welcome to STS Aviation Group‘s first quarterly newsletter of 2016. Many reading these words already know us as the company with “Solutions to Keep You Flying,” but what does that tagline truly represent, and how does it shape the turnkey services we provide the aerospace industry? Both are valid questions, and in the next few minutes, our team will do its best to answer them through the lens of every corporate division. So grab a cup of coffee, sit back, relax and enjoy the following articles. If you have any questions, give us a call at 1-800-800-2400. “Solutions to Keep You Flying“ is a tagline that was given to us more by our customers than our marketing department. We were happily identified as the guys who could help keep your aircraft in the air and producing revenue, and because of that identification, our company has continued to grow and exceed expectations. Part of the reason why we’ve been so successful has to do with the fact that STS is big enough to have the resources to support almost any reasonable need, but we are small enough to move quickly when presented with a challenge that can be solved with a little entrepreneurial spirit. Over the years, there has never been an all-encompassing service provider dedicated to solving the pains many aerospace companies experience daily, and that’s precisely the reason why STS has been able to come to the rescue time and time again. In other words, when we noticed a void in the industry, we wound up creating multiple corporate divisions — each with its own unique service offerings — and filled it. So the next time you’re faced with a challenge in your aircraft maintenance and engineering departments, keep STS Aviation Group in mind as a possible solution provider. We would welcome the opportunity to assist your team and look forward to working together to make your pains go away. Every position and department at STS Aviation Group works toward a common goal, which is to provide the aerospace industry with the personnel and resources it depends on to keep flying. The Client Services’ division at STS is no exception, but before I continue, I would like to take a brief moment and introduce myself. After all, this is the first time I’ve been asked to contribute to the company’s Quarterly Newsletter, and it makes sense for us to start in the obvious place. My name is Tamsin Brosche, and I am the Director of Client Services at STS Aviation Group. The department I oversee is relatively new to the company, but the work we do is critical to its overall success. Allow me to explain. Client Services is the go-to point of contact for STS’ customers. Not only do we focus on building strong relationships, we act as a consultative partner while providing the metrics and tools required to stay on top of joint initiatives and ultimately drive success. We listen to the pains and challenges our customers face with scheduling, staffing, timing, etc… and we work together to come up with logical and time-effective solutions to those challenges. By offering STS’ clients a means to openly collaborate in an effort to accomplish mutual goals, we swing the partnership door wide open and keep it ajar throughout the life of a project. Yes, companies hire STS to tailor RPO (Recruitment Process Outsourcing) solutions designed to suit very specific hiring needs, but it’s the relationships we form with our clients, the collaborative trust we build, that allows these partnerships to bare fruit for all parties involved. The Client Services department at STS is just one small piece of the puzzle when it comes to creating “Solutions to Keep You Flying.” My team and I love to build strong working relationships with our customers, and we thrive on helping them create new, innovative ways to stay on top of their game in both the immediate future and beyond. STS AeroStaff Services (STSAS) specializes in seeking out and hiring qualified Aircraft Maintenance Technicians to fill the workforce needs of our clients. In doing so, we not only put thousands of people to work every year, we supply the aerospace industry with the mechanics it depends upon to keep flying. In order to be successful at what we do, STSAS must lean on the skills and expertise of Client Services. The work they perform supports our staffing teams. It also ensures that customer priorities are understood and met with streamlined efficiency. Once we understand exactly what our clients are looking for, my team and I will tap into a growing number of modern recruitment tools that have been designed to seek out and find the best aircraft maintenance technicians in the business. In other words, we don’t just skim off the top of a resume pile and submit the first mechanic we happen upon. Instead, we dive deep to unearth the most qualified professionals for a position before we screen and submit them. In doing so, our team is able to create a highly-skilled workforce that has been hand picked to complete an aircraft’s service requirements. What does it mean to be the company with “Solutions to Keep You Flying?” That’s an interesting question, and I’ll do my best to answer it now on behalf of STS AeroStaff Services‘ engineering department. My name is Rachel Hood, and I oversee the corporate staffing operations that are directly tied to aerospace engineering. In other words, my team and I seek out and hire aircraft engineers and put them to work on behalf of our clients. We provide lucrative contract opportunities as well as long-term career placement, and our staffing services always come at no cost to the candidate. The professionals we employ may not physically turn wrenches on an aircraft, but they support those who do in variety of ways. Without the engineers we hire, thousands of mechanics wouldn’t have the plans they depend on to build or maintain commercial airplanes, business jets and helicopters. So when someone asks me what it means to be the company with “Solutions to Keep You Flying,” I tell them it means providing job security to the aerospace engineers we hire as well as safety to the air travelers that rely on the work they perform. STS Component Solutions (STSCS) has established itself in the market as not only the source to go to when you require hard to find aircraft and engine components, we also pride ourselves on taking a customers’ pain and providing an out-of-the-box solution designed to alleviate it. For STSCS, this is what separates us from our competition and enables us to provide our value-driven approaches to everyday problems that airlines, MRO’s or even OEM’s encounter. This approach is a core value of our business and what has been a key driver in its growth and success over the years. As the ever-changing market grows more competitive, and the purchasing and maintenance habits of customers and business partners continually change, it is very important to establish a business model that is fluid and flexible while still being able to maintain a culture and philosophy that is focused on value-driven solutions. Through my travels and discussions with industry friends and colleagues, I find myself often asked what still drives me. My most common answer is the challenge to solve customer pains and deliver custom solutions. These are the tasks that get our juices flowing here at STSCS and this how we like to rise to the challenge! This is in our DNA, this is what we are all about and this is why we are in business. So when you ask us what it means to be the company with “Solutions to Keep You Flying,” the answer lies herein… it is the challenge to rise to the occasion and take a customers’ pain and convert it into a success story. Much like the judicial branch that ensures compliance to the U.S. Constitution, STS Engineering Solutions (STSES) provides the same certification compliance oversight for aircraft safety with regard to the Federal Aviation Regulations (FARs). This is accomplished via the technical expertise of our 23 DERs, all of whom are directly authorized by the FAA. And just as the U.S. Constitution is continually challenged with regard to interpretation, DERs also provide this valued function to their area(s) of specialty (Structures, Electrical/Avionics, Systems, Power Plant, Interiors, Composites, DTA, etc…). Additionally, FARs become specific for small fixed-wing aircraft (Part 23), large fixed-wing aircraft (Part 25), small rotary-wing aircraft (Part 27) and large rotary-wing aircraft (Part 29). The decisions made by the DERs, which is finalized by the completion and submittal of FAA form 8110-3, is reviewed by the FAA (DER Adviser) and used as determination for yearly DER renewal authority. Whereas OEMs possess FAA approval for development and certification of new aircraft, parts, components and repairs, their inherent conservative nature stems from legal liability and a business model to sell new parts rather than creatively provide approval for repair requests. This is where STSES stands out as the industry leader. Couple a response time measured in minutes with the creativity of our DER staff, and STSES touts a high success rate in being able to cost-effectively negate the need for aircraft repair or develop specific repairs in compliance with the FARs. This results in faster return-to-service maintenance compliance. STS Line Maintenance (STSLM) is really starting to take off, and exciting times are ahead. The entire team is buzzing from an incredible year, and if things work out the way we hope, multiple new stations are planned for 2016. Before I set out to write this article, a question was posed to me by our marketing team… what does it mean to be the company with “Solutions to Keep You Flying?” In order to conjure a thoughtful response, I had to look back and reflect upon STS’ core values and what it is that we do for our customers. At STSLM, every action we perform is completed with customer service in mind. Whether it’s a Station Manager’s conversation at the gate with our technicians or a Maintenance Controller’s phone call during a delay situation, we work hard to deliver an exceptionally positive customer experience. 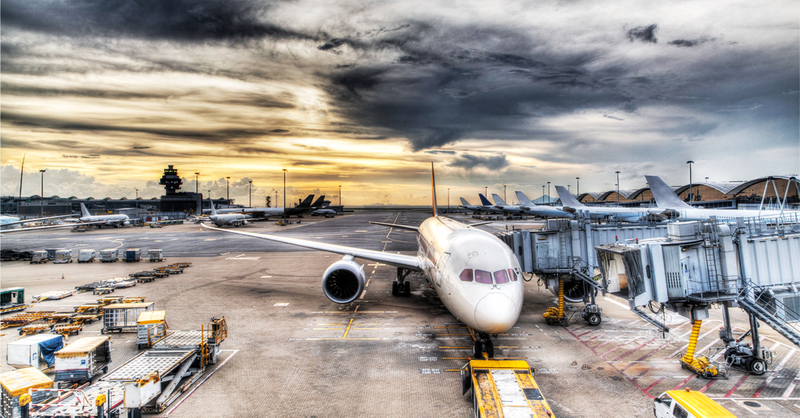 Every year, millions of people travel on your aircraft, and when things get delayed — or problems need to be addressed — STSLM operates swiftly and competently to get your airplane back in the sky both quickly and safely. The more effective we are at doing this, the happier everyone is. Our company has the unique opportunity to touch your aircraft and make sure that it’s ready for flight at all times. We also have the expertise required to address issues that can be considered customer impact items and reduce the complaints that often spawn from them. We remain committed to getting your customers to their destination in the safest, most efficient way possible, and we proactively seek new opportunities that will have a positive impact on a passenger’s in-flight experience as well as your company’s revenue. So the next time you’re wrought with pains on the flight line, think of STS and remember that a partnership is available to alleviate those pains, maintain customer satisfaction and increase your company’s operational performance. If you have any questions, please feel free to contact me any time. Thanks, and I’ll see you on the flight line. In this post, we would like to spotlight STS Aviation Group‘s Vice President of Information Technology, Rob Wire, and introduce 13 corporate employees whom have all been hired in the past few months. Rob is a former U.S. Navy Aircraft Structural Mechanic. He worked on the F-14A and was forward deployed on the USS Independence in the Persian Gulf right after the first Gulf War (91 to 95). Rob’s also a private pilot who enjoys flying all over Florida and the Bahamas, though its been a while since he’s taken to the skies. In the year 2000, Rob obtained a Bachelors degree in Computer Science from the University of Central Florida. He started working full-time for STS Services (that’s what we were called back then) in January of 2001 as its first Database Administrator. Over the past 15 years, Rob has taken on the roles of IT Manager, Director of IT and now, VP of Information Technology. Rob mentors and coaches a Lego Robotics League for a team based out of Jensen Beach Elementary; a team that just won a district championship. They go on to the State Regional Championships in February, and the entire STS Aviation Group staff is rooting for their success! As the Vice President of Information Technology for STS Aviation Group, I gather, develop and execute the IT strategy and budget for the entire enterprise. I also focus on the shared economy of scale solutions, proprietary custom software development and a private cloud option that keeps STS ahead of its competition. In addition, I lead a team of three talented managers and experts in their related fields of Enterprise Software Architecture, Infrastructure and IT Services. These professionals include Joshua Pierce, David Loewe and Stephen Keane. Stephen oversees the exceptional team of IT Specialists delivering helpdesk and customer support services to our entire staff who are our customers. Our team of dedicated professionals work tirelessly to deliver exceptional solutions. We listen to the pains of STS’ clients and convert them into unique opportunities that help them succeed. Airplane – As a private pilot myself who used to fly Pipers and Cessnas back in the 90’s, I love the part where the pilot seen below is receiving clearance to take off… It cracks me up every time I watch it. A major commercial airline strike in 2005 called upon STS to augment its labor force in an effort to keep the airline safely operational. Our team rallied and delivered a unique and exceptional solution to meet the needs of air travelers across the country. Laura joined the STS family as a Technical Recruiter back in July of 2015. She currently lives and works in Oshkosh, Wisconsin, but spends a lot of time with the STS Technical Services’ team in Milwaukee. Laura has been working as a recruitment professional since 2010. She has a grounding passion for geology and is a nationally registered jeweler. Laura and her fiance have traveled to just about every Wisconsin State National Park this past summer where they spent time kayaking as well as picking up rocks and minerals. Next year she hopes to make a trip to North Carolina to go digging for pink tourmalines (your guess is as good as ours). If that doesn’t happen, she admits that digging prehistoric fern fossil outcrops in Pennsylvania would also be sweet. Part of her travel bucket list is to visit every United States digging zone for gemstones. Some may call this hobby nerdy, but we think it’s a great way to get outside and explore the world around you. Don’t judge. Born and raised in Palm City, Florida, Robert spends his time outside of the office with family, friends and his beloved dog. He has more than a decade’s worth of training in Shotokan martial arts (you do not want to mess with this guy) where he earned a black belt for his efforts. Robert enjoys the outdoors — particularly fishing — and has always had a passion for drawing and the arts. Before joining STS, Robert was a chemical manufacturer, and he considers himself lucky to have fallen into recruiting via a mutual friends that works at our company. Jamie Tuttle joined STS Technical Services in August of 2015 as a Contractor Care Representative. In her role she works directly with the company’s contract employees and makes sure that their needs are met and that they’re properly being taken care of. When she is not at work, Jamie loves spending time with her 18-month-old daughter, Rose. She also enjoys teaching arts and crafts and dancing crazy in the living room when no one is watching (we asked for a YouTube video of this but to no avail). In the future, Jamie very much looks forward to getting to know everyone in the STS family, both contractors and internal staff alike. Sofia’s from Quito, Ecuador, and she moved to the United States in 2003. She has a five-year-old girl and loves to spend time with family and hang out with friends. Sofia is currently working as a Recruiting Coordinator inside of our Denver office, and she’s thrilled to be a part of the team. Matt Hoye is originally from Amityville, New York, and he recently moved to Wisconsin, the state where his wife is from. Matt is involved in community theater, sports and loves going to the movies and spending time with his family. He started working at STS Technical Services in August of 2015 and really enjoys all the different people and personalities he interacts with. Lisa has been with STS Technical Services since September, 2015. She lives in New Berlin, Wisconsin, and is married to her high school sweetheart with whom she has a beautiful 16-month-old son named Logan. Yanis lived in Cuba until she was five-years old. At that point, she moved to Miami for a little more than a year before heading to Stuart, Florida, and ultimately Port Saint Lucie. When she is not at work, Yanis enjoys spending time with her two children and extended family, reading a good novel and watching movies. “I was hired by STS to act as a Recruiting Coordinator, and I have never worked for a large company that values their employees so much. I am truly thankful to be part of such an amazing team, and I’m really looking forward to growing with the company and learning more about the aerospace industry in the years to come. Kim Bauer was born and raised in the Kansas City area, and she is the proud mother of two boys. Kim is new to the aviation industry, but she’s been doing an incredible job acclimating herself and learning the ropes over the past few months. Stephanie is originally from South Bend, Indiana, though she came to Denver via Las Vegas. She has a B.A. in Psychology from Saint Mary’s, Notre Dame (Go Irish!) and a Master’s in Business Psychology from University of the Rockies. Stephanie has been married to her husband Scott for seven years, and they have two Border Collies, two rabbits and a semi-famous Ragdoll cat (@franksinatracat). She also enjoys travel, karaoke and yoga. While new to aviation, Stephanie has been recruiting for four years. Right now, she’s working on hiring aerospace engineers and enjoys the challenge of finding the right candidate for every job. Vanessa was born in Maracay, Venezuela. She has a B.S. degree in International Business and enjoys the outdoors, working out, running and spending time with her family. Vanessa moved to Florida in 2014, and working on the Customer Support team at STS Component Solutions has been her first job in the United States. Born in Long Island, N.Y. but raised in sunny south Florida, Vanessa is 30-years old and has been married to her husband Steve (pictured left) for three years. Together they have a beautiful baby boy named Bradley who is one-year old, and he’s the light of his parents’ lives. Outside of work, Vanessa enjoys spending time with my family and friends, cooking, and watching movies. Charles is from Palm City, Florida. He graduated from Florida State University in 2011 and Le Cordon Bleu Culinary Arts School in 2014 (dude is a master chef). In his free time, Charles enjoys cooking (obviously), playing guitar and spending time with his dog Kobe. Right now, Charles is working as a Technical Recruiter for STS AeroStaff Services in Jensen Beach, Florida. Jason was born in Long Island, New York and raised in Jensen Beach, Florida. He is finishing his Associates degree in computer science this April and would like to transfer to UNF in order to continue his studies. In addition to being an all-around awesome guy, Jason is a black belt in Kung Fu (another guy you don’t want to mess with) and an eagle scout. He also likes to ride his long board, do parkour, play video games and make music with his computer.